The Pixies’ return with “Head Carrier,” their second album since the band’s split in 1993 and reunion in 2004, was awaited by many with a combination of anticipation and dread. For some, it was a hopeful promise of the band’s gradual reversion to their roots as a dynamic machine made of pure, raw energy. 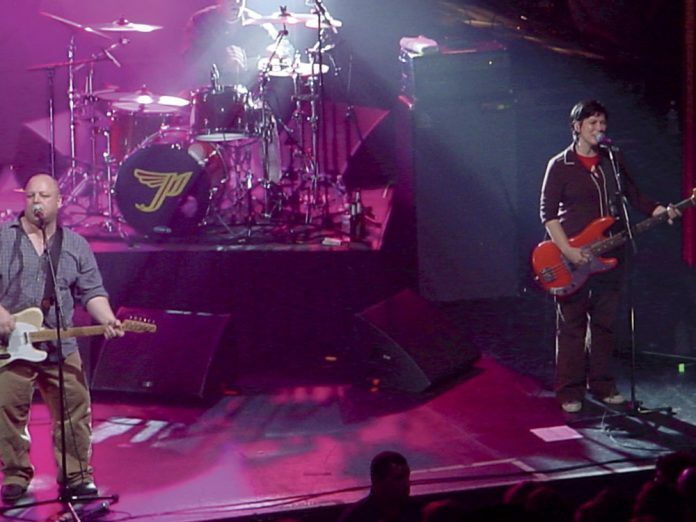 To less optimistic listeners, it cements the Pixies’ deliberate shift to the more subdued and less erratic sound of “Indie Cindy,” an album reviewers and fans alike considered to be a dent in the Pixies’ otherwise stellar discography. It seems one can no longer justify “Indie Cindy” as just a failed experiment. Taken in this new context, it now seems to be more of a launchpad for the sound heard on “Head Carrier.” In this sense, “Head Carrier” is a step forward where “Indie Cindy” was two step backwards. “Head Carrier” presents a wholly new sound, while still channeling the elements of their earlier albums, “Surfer Rosa” in particular. Traces of “Bone Machine” can briefly be heard in “Head Carrier,” the LP’s title track through the low thrumming set against Joey Santiago’s still stellar riffs. “Baal’s Back,” the obligatory short-lived scream on any Pixies album, is an unapologetic declaration that Black Francis and his shredding vocals are indeed back. Though somewhat more restrained than “Tame” off “Doolittle,” Black Francis’ bold assertions (“I bet you thought that I was dead and gone”) and his sardonic question to anyone who doubts the band’s new direction in favor of nostalgia (“Are you saving/Are you saving it for me/Are you saving all your precious love for me?”), makes his message crystal clear; he may have “something against” us for holding onto idealistic expectations of a band that has clearly evolved greatly since their beginning in 1986. Perhaps the hardest part of listening to new music put out by the Pixies is accepting the fact that the modern age has somewhat demystified them. At their formation, they represented a sort of enigma. They were a band that should never have been able to work in the first place, and yet they set the groundwork for influential, more widely known bands such as Nirvana, Weezer and Radiohead to name a few. Their raw, hauntingly beautiful melodies set against abrasive guitar and vocals managed to communicate epic, often nonsensical, stories with elusive meanings. They were a completely singular act, with songs dealing with offbeat and somewhat horrific subject matters in a way that was often humorous and always profound. Although it is easy to fall into the trap of nostalgic longing for a band, it’s important fans remember that all creative endeavors are living, breathing things that, however unfortunate, must evolve at some point. Where “Indie Cindy” and the departure of Kim Deal was the rude awakening, “Head Carrier” is the reminder of the Pixies’ potential for greatness, and the reassurance that Paz Lenchantin is capable of patching together the hole left by her predecessor. “Head Carrier” nods to their past work without recycling it, while hinting toward their future within the same breadth. The Pixies don’t sound like they did thirty years ago, but their newest album seems to have found a happy medium between their older work and their new evolution, while making the statement that they know exactly what they’re doing.